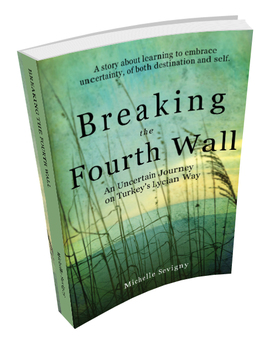 An autographed paperback copy of Breaking the Fourth Wall: An Uncertain Journey on Turkey's Lycian Way, will be mailed direct from my writing studio on Gabriola Island, British Columbia, Canada. Link to purchase via my Dogsafe Canine First Aid company. Payment options are credit card or Paypal. International? It'll be $25 shipping & handling, please email me at michellesevignywriter@gmail.com before ordering. Want 31 or more? Please email me at michellesevignywriter@gmail.com for a quote. If you buy a signed copy from me, I'll include a 30 minute Skype session to chat about the book! Want to know the stories behind the stories? Ask me anything!